It’s officially hurricane and wildfire season again, and if the past couple years are any indication, we’re likely to see a few natural disasters. Hopefully you’re not impacted, but rather than wait until one is imminent in the news, we all need to take some time to make sure we are ready if we find ourselves in an evacuation situation. My family was impacted directly a few years ago due to wildfires in Colorado, and it can be an overwhelming scenario. There are many emergencies that may result in the need to evacuate – sometimes you have time to prepare and sometimes you may need to evacuate immediately. Having a plan ahead of time can help ensure you are able to react quickly and evacuate safely. Understand what types of disasters are most likely to occur where you live (hurricanes, tornadoes, blizzards, wildfires, earthquakes, etc.) and what the local response plans entail. This includes local places to be used as shelters. We are less worried about earthquakes here in Colorado, but you can be sure we are ready for blizzards around here, even in June! Identify several places you could go if forced to evacuate, perhaps available shelters, or a friend’s home in another town or a motel. Have several options in different directions. Have a communication plan for your family so you can stay in communication and re-unite if separated. Assemble supplies you will need like clothes, food, and water. 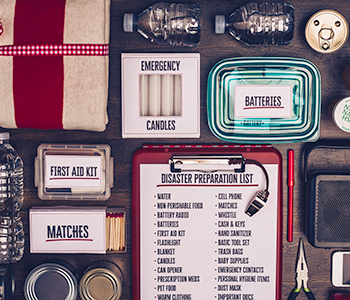 Include an Emergency Supply Kit and an Emergency Financial First Aid Kit. Store supplies in a place that is safe and accessible so you can get to them quickly if necessary. If evacuation seems likely, have a full tank of gas in your car and keep an emergency kit in the car. It’s a good idea to keep cash on hand as well, perhaps inside your emergency kit. Try to have smaller bills on hand, in case you find yourself in a situation where you can’t change a twenty dollar bill. If your workplace has an emergency phone line, program that in to your phone. If not, make sure you have your supervisor’s contact information stored in your contacts so that you can be in touch with work if needed. Take all supplies prepared above and a radio. A portable charger for your devices may come in handy as well. Follow evacuation instructions and use recommended evacuation routes to not impede emergency responders. Avoid flooded areas. Take your pets with you and learn how to Plan For Your Pets in an emergency. If you have time, email friends and family and let them know where you are going. Secure your home and unplug electrical equipment. Take one car per family to minimize congestion and leave as early as possible. Check with your neighbors that may need a ride. Remember to rethink your supply kits and family needs at least once a year and replace items as needed. As we have heard from local officials after previous events, stuff can be replaced and homes rebuilt, so focus on your safety and the safety of your neighbors should you be forced to evacuate. For all the ways to be prepared financially, check out the American Red Cross guide on Disasters and Financial Planning.